A while back a fellow knitter asked me to write up a pattern for a mug cozy and since then I’ve been slowly, bit by bit, working on it. After trying out many (and I mean many) different stitch patterns, I finally found one that is to my liking. 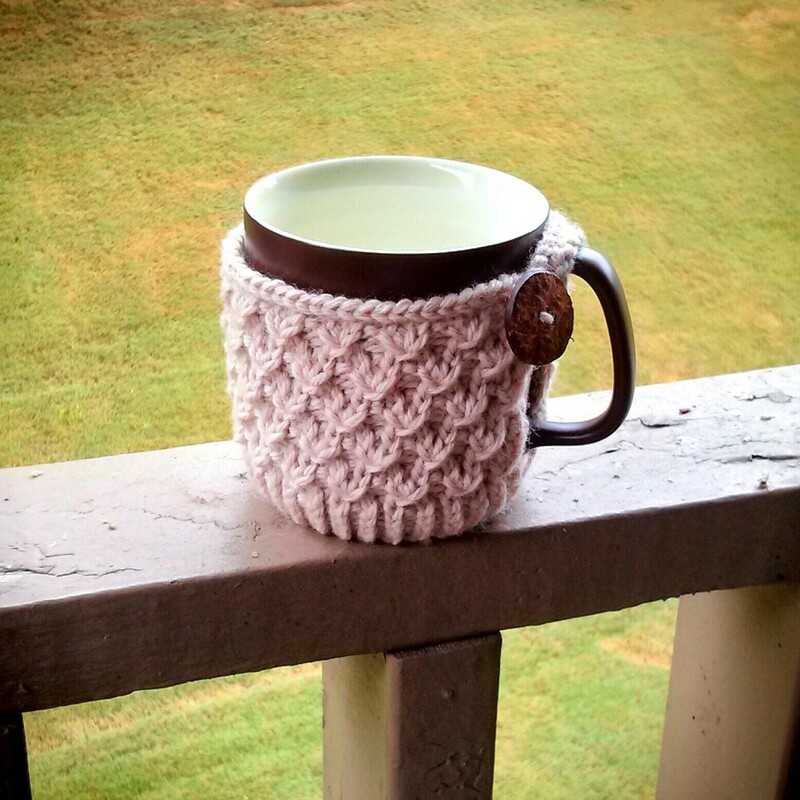 This mug cozy was constructed using rib 1×1 stitch and diagonal knot stitch. The bottom edging was knitted in the round using the rib 1×1 stitch and the main portion was knitted back and forth using the diagonal knot stitch. Below is the free pattern. Hope you all enjoy! First we will begin by knitting in the round. Round 1: *K1, P1; repeat * to last st, K1. Repeat Round 1 four more times. If you would like for the edging to be larger, feel free to repeat this row several more times (keep in mind the placement of your mug handle). Begin knitting back and forth. MK (Make Knot)=k3tog leaving sts on needle, yo, then knit same 3 sts together again. ROW 1 (RS): K4, P1, *K3, P1; rep from * to last 4 sts, K4. ROW 2: P4, K1, *P3, K1; rep from * to last 4 sts, P4. ROW 3: P1, *MK, P1; rep from * to end. ROW 6: P2, K1, *P3, K1; rep from * to last 2 sts, P2. ROW 7: K2, P1, *MK, P1; rep from * to last 2 sts, K2. Repeat Rows 1-8 as needed. For this example, I repeated Rows 1-8 twice, then I knitted Rows 1-4 which was a total of 20 rows. Depending on how tall your cup is, please modify the number of rows accordingly and be sure to end on the WS or even numbered row. 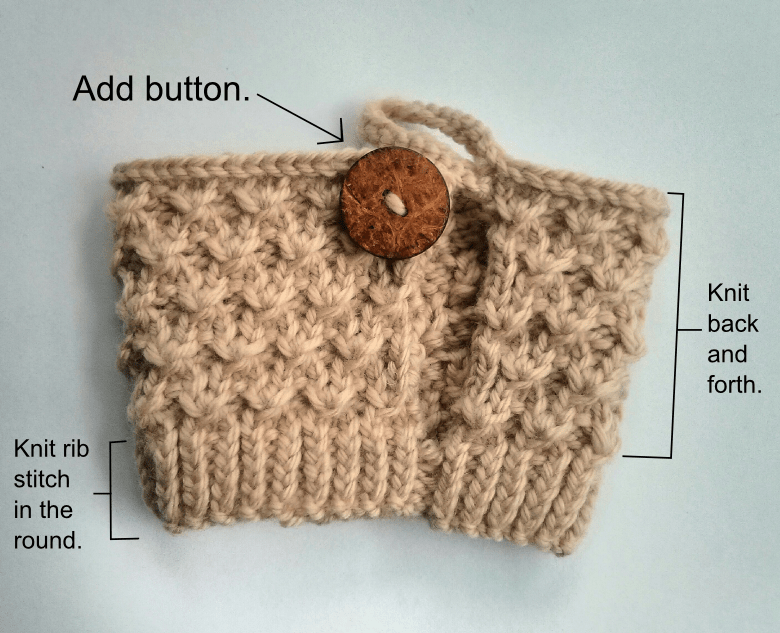 Knit the next row (RS) and cast on 20 sts at the end using the thumb method. Now turn your work and bind off purl-wise. 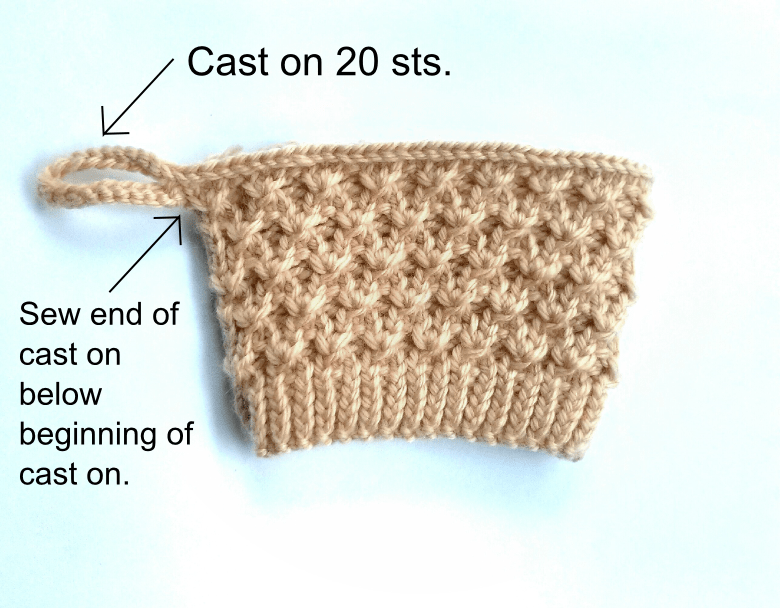 Using a yarn needle, sew the end of the cast on piece to the section located below the start of the cast on as shown above. 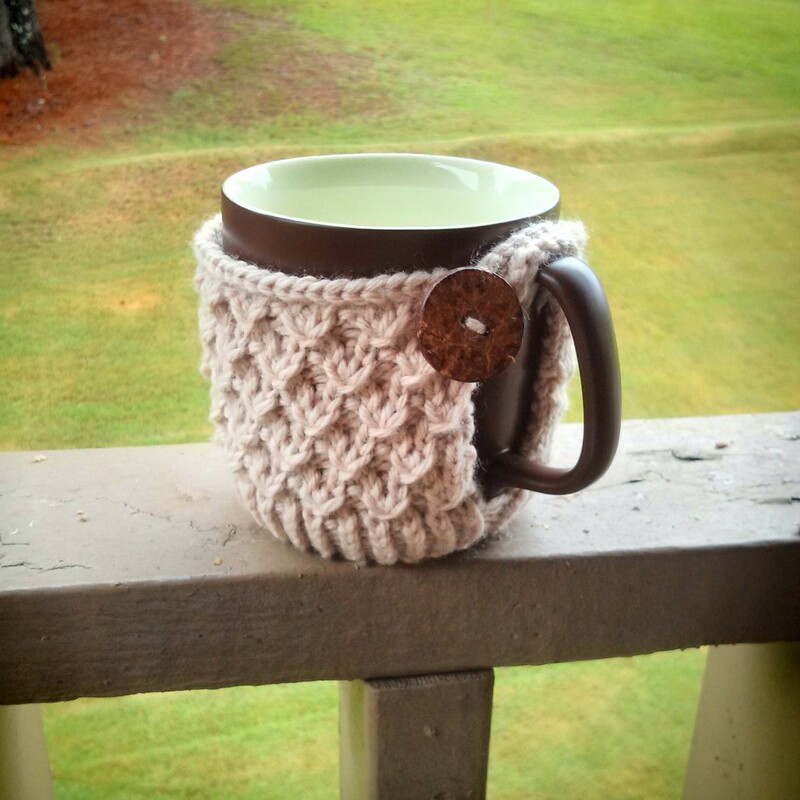 This creates the button loop for the mug cozy. Sew on the button in its appropriate place. Finally, sew up loose ends and you’re done! If you enjoy this pattern, please Like us on Facebook! 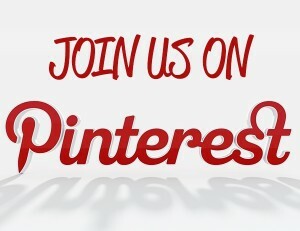 Many Great Things Happening at Purl Avenue! So glad you enjoyed it and thank you so much for the shout out! Hi, I have a question about the Multiple of 4 sts + 1. What does that mean and how do I knit that? Multiple of 4 sts + 1 means that the pattern is counted in multiple of 4 stitches + 1 stitch. For example, in the pattern, there are 65 stitches. This consists of 64 stitches (which is a multiple of 4) and plus 1 makes it a total of 65. Hope that helps. Is the multiple of 4 sts + 1 integrated into the pattern already? Instead of going the usual direction for knitting in the round, simply turn the work and knit the opposite direction as if knitting a scarf (called knitting back and forth or knitting flat). Ah, but with the needles still in “round” format? Gotcha. Thanks so much for the reply!